We offer an array of truck running boards and step bars. Stop in today and allow our knowledgeable staff help you find the perfect components for your ride! Texas Hitch & Truck Center has a complete line of step bars and running boards for your truck, Jeep, or SUV. Our Austin and San Antonio, Texas, stores stock and install a wide variety of step bar options. Our truck running boards and step bars are manufactured from leading brands – we don’t sell knockoff junk. Come on by and let one of our knowledgeable salespeople find the right truck step bars or running boards to meet your specific needs. We offer a variety of truck step bars in many different sizes, shapes, and styles. We've got step bars in your choice of black powder-coat or polished stainless steel in lengths ranging from cab length to wheel-to-wheel. We offer step bars from Aries Automotive, Westin, Trail FX, and Go Rhino in 3", 4", 5", and 6" models. 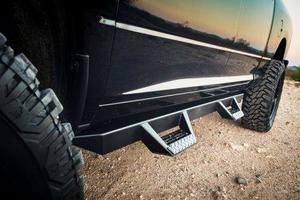 Our line of drop-hoop step bars set your ride apart due to their striking off-road appearance. We have drop-hoop step bars in gloss black, matte black, and stainless steel. 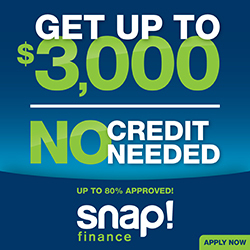 We proudly sell products from N-Fab, ICI Magnum, Go Rhino and Ranch Hand. Texas Hitch and Truck Center also offers a complete line of running boards for a variety of vehicles from small SUVs to lifted heavy-duty trucks. We sell running boards from Aries Automotive, Westin, Amp Research, Trail FX, DeeZee, Rock Slide Engineering, and many more reputable manufacturers. We sell and install step bars in many different sizes and shapes. We've got them in powder-coated black or stainless steel, cab length or wheel-to-wheel and in 3", 4", 5" or 6" models. Some of the brands we offer are Aries Automotive, Westin, Trail FX, and Go Rhino. Wheel-to-Wheel in 3", 4", & 5"
Our line of drop-hoop step bars offer a rugged bar with an off road look to set your ride off. We have them available in gloss black, matte black or stainless steel and in cab length or wheel-to-wheel versions. THTC proudly offers product from N-Fab, ICI Magnum, Go Rhino & Ranch Hand. THTC offers a complete line of running boards for your small SUV or to your lifted HD truck. We offer running boards from Aries Automotive, Westin, Amp Research, Trail FX, DeeZee, Rock Slide Engineering & many more.